Three archdiocesan seminarians studying for the priesthood at Saint Meinrad Seminary and School of Theology were ordained deacons by Archbishop Joseph W. Tobin at the Archabbey Church in St. Meinrad on April 26. The newly ordained deacons are Adam Ahern, Michael Keucher and Andrew Syberg, all studying for the priesthood in the Archdiocese of Indianapolis. 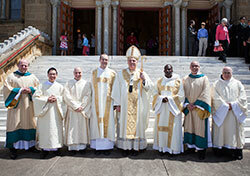 Four others not of the archdiocese were also ordained to the diaconate.